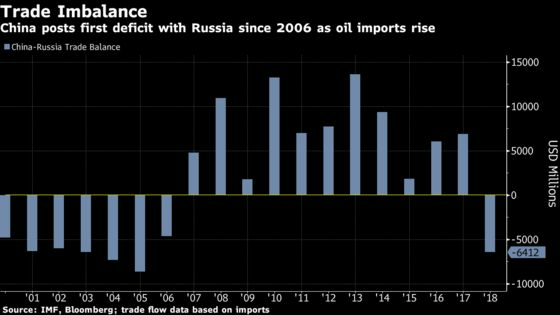 (Bloomberg) -- China, which had its first trade deficit with Russia in 12 years, is pushing for evolution in their economic relationship. China swung to a bilateral deficit of $6.4 billion on total trade with Russia of $111 billion in 2018, according to International Monetary Fund trade flow data. That was the first time since 2006 the balance was in Russia’s favor. China’s main exports to Russia include machinery and power equipment, electronics and apparel. It’s aiming to supply more infrastructure, such as rail systems, as President Xi Jinping’s Belt & Road Initiative is advanced. Russia was China’s biggest supplier of crude oil for a third straight year, ahead of Saudi Arabia and Angola, with imports rising 61 percent to $38 billion, according to China’s General Administration of Customs data. Coal and timber were among other major imports. “Russia has vast territory and abundant resources, while China has to focus on per capita output because of the size of its population,” Xu was quoted as saying by the Global Times, which featured comments from three other economists.